The expression "home advantage" is one commonly used to describe the benefit that a team or individual sportsman has in playing on home territory; it was never more visible than in Edinburgh last Saturday. Scottish Rugby's stadium has been dubbed "Fortress Murrayfield" in the past to signal just how hard it has been for visiting teams to win there. The fortress's defences have been breached rather often in recent times with Scotland's international team going through a long bad patch. But no more. With successive wins against France and England (the most fancied sides in the 6 Nations championship) the fortress has been rebuilt and Scottish rugby fans can sing again about sending the opposition "homeward tae think again". These words from "Flower of Scotland" refer to one of the Scots proudest days when King Robert the Bruce defeated the English Army under Edward II at Bannockburn in 1314. It was Edward who was the first invader to be sent home to think again! The English rugby team has suffered the fate of Edward fairly frequently over the years but since 1990 (Scotland's "Grand Slam" year) wins against the Auld enemy have been harder to come by. Before Saturday Scotland had only used their home advantage to get a win once over these years - on a very rainy day in 2000 when they handled the wet ball better than the English (who, of course, complained that the conditions were against them!). There were no such complaints last Saturday for although it was very cold indeed (I was not the only spectator shivering in his seat) it was dry and clear; ideal, you would think, for the handling game. Strange then that this was a match without tries - a rarity in the modern game. Both defences were excellent but the Scots were truly heroic as they repelled proud Corry's army over and over again. Despite the lack of tries it was one of the best rugby matches I have ever seen, and the Scots deserved their win. A passionate and noisy crowd fired the Scottish players up and this support undoubtedly contributed to their success. As usual a few ill-mannered Scots nationalists stayed seated through the National Anthem (see photo) but whether this, or the pre match show put on by the Scottish Rugby Union (SRU) also helped their team I am not so sure. With kilts swirling and pipes playing we were treated to all the usual razzmatazz of Scottish national fervour. The SRU really pulled out the stops this time because we also had a "tribal Scottish perfomance" in the pre match build up with echoes of Bannockburn and Robert the Bruce (no doubt Rob Roy, Robbie Burns and Flora Macdonald as well). There were also flame-throwers, strobe lighting displays and even the firing of an artillery field gun. The Scottish flag was paraded (but not the English) and the Scottish team was announced man by man to cheers (but you had to look at your programme to find the names of the English players). I have never been to such a one-sided pre match build up at any sporting event and whilst the England team won't have been surprised at the discourtesy shown to them, the Scottish team may have been a tad embarrassed. Home advantage is perhaps the best evidence that much of sport is played in the head rather than with the hands and the feet. You take two teams of equal technical ability and skill but the one playing at home has a clear advantage. For example in the English football "Premiership" this year to date teams have won 50% of their home games but only 30% of away matches - indicating the extent of the benefit of playing on a familiar pitch in front of a friendly crowd. In cricket that advantage is also that pitches can be prepared to suit the home side and this goes on around the cricketing world (however groundsmen and curators may deny that they work to such instructions). It is a valuable part of sport that to "win away" is often the highest achievement that any side can aspire to. 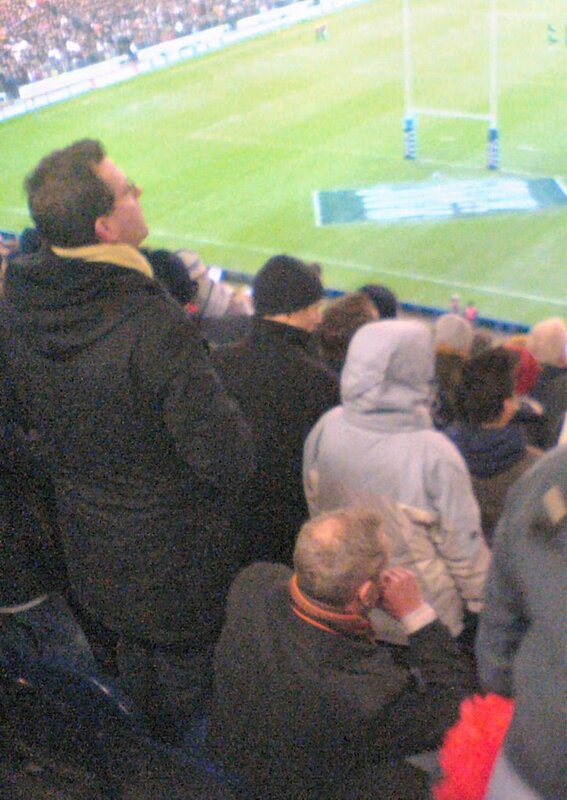 This was beyond England at Murrayfield this time around and it may be beyond them next week in Paris as well. All but one of the nine matches played in the 6 Nations so far this year has been a "home win" and it is quite possible that all the remaining fixtures will follow this pattern. In international rugby it does seem that there's "no place like home". When I attend football matches I usually sit in a seat that is roughly half way up one of the side stands and as close to the half way line as possible. This vantage point gives a view of the game from which the whole pitch can be seen and it allows you to see all the moves in the game clearly. When television cameras cover a match this is the position of the main camera, and it is also where the media sit. 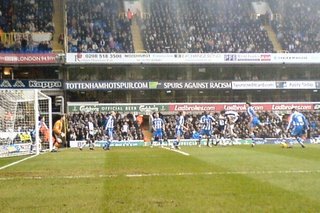 But last weekend I decided to abandon my usual position and sit on the touchline at White Hart Lane for Tottenham’s game against Wigan – and what a very different perspective of the match this gave. I was in the very front row of the lowest tier of the stand within a metre or so of the side line and the corner flag. When the action was close by I could almost touch the players and could certainly hear what they said to one another, and to the referee. 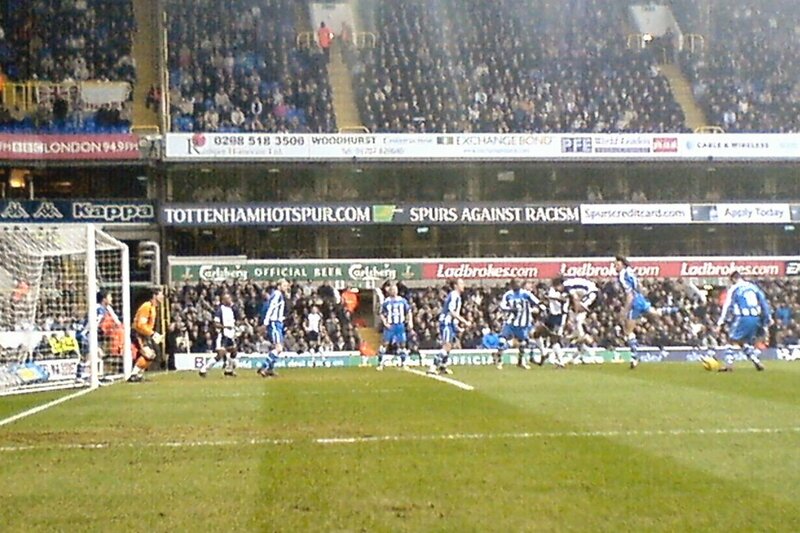 When Spurs Egyptian international Mido was booked (right in front of me) he showed that he has mastered the English language (or a colourful part of it) very well since moving to Tottenham. Sitting in a seat like the one that I had on Sunday you get no feel at all for the overall pattern of play, but you do see, of course, one or two incidents very clearly. You realise much more than you do in a more remote seat, just how frantic is the pace of the modern game. A player receiving a pass has a fraction of a second to kill the ball decide what to do with it and complete the move and it is remarkable to watch this from very close to the action. I suppose that these skills are taken for granted at the top in football but they are none the less impressive for this. There were two goals at the end that I was closest to and in each case the goal had been scored before I even realised that it was a possibility the pace was so quick. It is said that eye witnesses who are close to an accident often give completely contradictory reports of what they think that they have seen, and it is the same in sport. You can be too close to the action. The other difference in sitting in a seat so close to the pitch is that you feel much nearer to the other spectators as well. At White Hart Lane the noisiest supporters amongst the home fans sit in the lower tier of the South stand which was right next to where I was sitting. The word “fan” is short for “fanatic” and that word is certainly apposite for this group. They chanted right through the match led by a man with a large drum which he banged rhythmically all the time, and they were fully emotionally engaged for the full ninety minutes. The chants were rather disappointingly witless but at least they were not too insulting either - which will have pleased the club officials who put a message in the programme condemning offensive chanting. The referee (a black man) was roundly abused for many of his decisions and his parentage was occasionally questioned but thankfully none of this abuse was racially motivated. Spurs have an ongoing campaign which deplores racism in football and it seems to be effective. Less welcome is the fact that although the ground is an all-seater stadium the group of fans in the lower South stand ignore the rules about saying seated for most of the match. This is something that the stewards struggle to control (although they try) and is regrettable, not least on safety grounds. Attending a football match and sitting in the sort of seat that I was in on Sunday is as much a social, even tribal, experience as it is a sporting. As with all tribes there are rituals which you have to obey and certain behavioural norms are required. One of the chants is “stand up if you hate the Arsenal” which triggers a pavlovian response from those in earshot. Quite what my grandfather, who was a regular spectator at both Spurs and at the Arsenal in the 1930s (and supported both teams), would have thought of this I wonder. He certainly wouldn’t have stood up when asked to – and in his honourable memory nor did I! The England cricket team has arrived in India to prepare for a three Test match and seven One Day International series. The first Test begins in Nagpur on 1st March. If we discount the matches against the minnows of Bangladesh and Zimbabwe then England has played eleven Test matches since January 2005, winning only three and India has played nine, also winning just three of them. Quite how that makes the two sides to be vying with one another for the accolade of second best Test side in the world behind Australia some may question. Admittedly England over that period has famously regained the Ashes whilst India’s only series win was against Sri Lanka who have slumped to next to bottom in the ICC’s rankings (minnows excluded). But all of this won’t count for much when the two teams square up for the first Test. Expect a fierce and fascinating challenge between two very good sides and look forward to some intriguing contests within the contests between some of the star players. 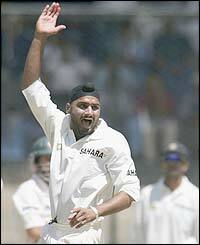 India has not played England since The Oval in September 2002 when the series was drawn. Only three of the England side in that match will line up at Nagpur (Trescothick, Vaughan and Hoggard) whilst India will probably have seven if they pick the same side as lost their last Test in Karachi (Laxman, Sehwag, Dravid, Tendulkar, Ganguly, Kumble and Khan) or eight if room is also found for Harbhajan Singh. Harbhajan, of course, has not taken a wicket in his last three Test match innings in which he has bowled 81 overs but I would be astonished if he does not regain his Test place against England and I would expect that his spin partnership with Kumble to be the main bowling weapon for India (as it was in 2002 when they took 26 wickets between them in four matches on wickets much less favourable to spin than will be the case at home). England prospered last summer despite facing the genius of Shane Warne and if they can master India’s spin attack in this series there is no reason why they should not get back in winning ways next month. The England batting line up is formidable and whilst they disappointed against a wholehearted Pakistan side last November they will be keen to get back into form against India. There is a good balance in the England batting line up with Michael Vaughan, Andrew Strauss and Ian Bell capable of playing anchor roles to allow the strokemakers (Trescothick, Pietersen, Flintoff and Geraint Jones) to entertain. Aside from the spinners England need to be wary of Pathan (who they will not have seen before) and Khan - but if they bat to their potential England should be able to post decent totals to give their bowlers room to attack. For the first time since Trent Bridge in August last year England will have the excellent Simon Jones in the team to bowl alongside Harmison, Flintoff and Hoggard. This is the best fast bowling attack in world cricket and was the key to England’s Ashes success. Jones was missed in Pakistan and his return will give England a big lift. India’s strength is their world class batting line up (Dravid, Sehwag, Tendulkar and Laxman) and the battle between these stars and England’s fast bowlers is eagerly awaited. India’s batsmen do not need to lose much sleep over England’s spin bowing threat. With Giles injured England will choose from three spinners, Udal, Panesar and Blackwell of whom only Udal has played a Test match (three wickets for 277 runs in three matches). So the two key questions in the series are how well India cope with England’s fast bowling strike force and how well England’s batsmen cope with the Indian spinners. In the last Test match to be played at Nagpur, in October 2004, India were bowled out for 185 and 200 by McGrath and Gillespie who took fourteen wickets between them in a match that was more of a struggle for the spinners of both sides (even Shane Warne) . A similar wicket on 1st March would suit England nicely! No student of cricket sensibly makes predictions when India play with their off the field dramas usually proving as much colour as the on the field performances. But talent they certainly do not lack and their Australian coach will have a few personal points to prove against the Poms. Should be fun! If ever there was a good example of the truth of the aphorism “Who dares wins” it was at the Dubai Desert Classic last Sunday. Tiger Woods had not been hitting the ball well off the tee all week, by his own imperious standards. His driver was not working as well as it should with too many very wayward drives getting him in trouble. True the Tiger’s short game was as solid as ever and he usually managed to recover from a bad drive with his short irons and this kept him in the hunt for a win. Reaching the 17th hole in the final round Woods was one of three or four players in with a chance. This hole is a short Par 4 (359 yards with a dog leg to the right) and for a player of Woods power the green is reachable off the tee, but it is a risky shot as Woods had already found out to his cost in previous rounds. The cautious thing to do would have been to play safe with a solid drive down the centre of the fairway, followed by an approach which would give a decent chance of a birdie. But this was not what Woods chose to do. Out came the driver and this time the contact was sweet. The ball landed on the front of the green and two putts later the Tiger had his birdie. Some would argue that Woods bravery was cushioned by the fact that he had already pocketed a cool $3million in Dubai appearance money alone and that, therefore, he had nothing to lose by a spot of daring-do. To say this underestimates just how much the Tiger still has the urge to win. That he can command mega dollars just by turning up is a fact which he puts out of his mind when he is on the course where he has a single-minded obsession to win. When he plays a poor shot (as happened quite often last week) he doesn’t shrug his shoulders and smile but he glowers with anger and often indulges in a bit of mild club abuse as well. He is driven to succeed every time he plays not to add to the gold in his personal vault, but simply to prove again that he is the best. At Dubai he had failed twice in his previous visits and it hurt. In 2001 he had a double bogey on the final hole which cost him a win, and he had to be coaxed out of the locket room to appear at the presentation ceremony so great was his disappointment. But this year the Tiger put all that right without really, by his own admission, playing well. But he fought, and he scrambled and he dared…and he won. Whilst Tiger Woods and Mark O’Meara (the only other American in the field) were playing in Dubai the rest of the PGA Tour were in Phoenix competing for the FBR (Phoenix) Open. Now this tournament is popular with fans and has a long history - but what a shame that it clashed with the Desert Classic. There are no less than 56 events on the PGA tour this year which means that players on the tour certainly have no need to travel if they don’t want to. Indeed it is likely that for most Americans on the Tour their only foray across the pond will be to the (British) “Open Championship” at Hoylake in July or (if they are lucky) to the Ryder Cup in Ireland in September. Most American golf fans, and even many professional golfers, are woefully ignorant of golf tournaments outside of North America (other than the “Open”) and little progress has been made in recent times to getting a more unified international professional golf calendar. The Dubai Desert Classic is unquestionably one of the finest events in the golfing year anywhere in the world. The organisation, the course and the usually strong field make it an event that all the pros on the European Tour want to win. Surely the time is now ripe, especially given the publicity that the Tiger’s win will have generated, to recognise the Classic’s success by enhancing its status. The PGA Tour could help this by avoiding scheduling a top American event at the same time and by giving the Classic a higher profile in the media. And to have a couple of dozen players from the PGA Tour in Dubai next year might give American/Middle East relations a bit of a much needed boost as well!